Chicago officials dedicated a South Side park to Hadiya Pendleton, a 15-year-old girl killed by gun violence. CHICAGO (WLS) -- Chicago officials dedicated a South Side park to Hadiya Pendleton, a 15-year-old girl killed by gun violence. 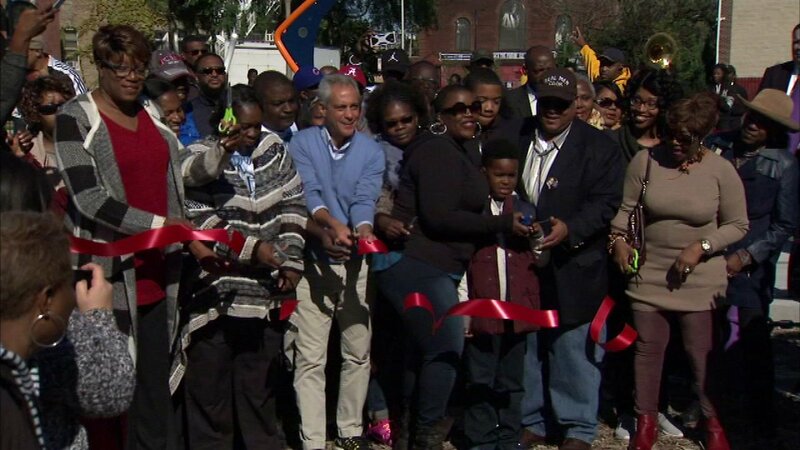 Pendleton's parents helped Chicago Mayor Rahm Emanuel cut the ribbon on Saturday. The $1.2 million renovation project renamed Buckthorn Park to Hadiya Pendleton Park. The King College Prep student was fatally shot a few blocks away from the park in 2013. Two men were charged in Pendleton's death but have not yet gone to trial. "It's been a long time coming and we are truly grateful," said Cleopatra Pendleton, Hadiya's mother. "Next step justice because we still do not have justice for her life being taken. We're waiting for that." Visitors to the park can enjoy a walking path with three separate exercise stations.